s part of the inaugural Perthshire Archaeology Week, on the 15 June 2003, Mark Hall of Perth Museum and Art Gallery led an enthusiastic party around the early medieval landscape of Struan. We looked at three elements in particular: 1.The Garry-Errochty river junction and placenames; 2. Struan Kirk and Kirkyard; 3. Struan mound. This article is by way of a brief account of that walk-and-talk. We began our historical exploration where the waters of the River Garry and the Errochty Water meet and thus define a rather peninsula-like piece of land on which Struan Kirk stands. Struan drives from the Gaelic word sruthan, meaning 'place of streams, confluence' and so is an eloquent description of the meeting of the Garry and the Errochty. The word Errochty is also of Gaelic origin and means 'Assembly place'. Garry, incidentally, may derive from the Gaelic for thicket or den or it may be from the name Garaidh, an Irish hero. That these names have a Gaelic origin suggests that they were named at the time of Gaelic settlement from the West Coast (present day Argyll, in the past Dalriada) during the 7th/8th century, giving rise to the Gaelic kingdom of Atholl. The place name Struan may seem no more than a prosaic description of a place where two rivers meet but it is clear that such places had a notable value to early medieval peoples. A Pictish or British equivalent, Aber, is one of the commonest surviving such place name elements, meaning 'at the confluence of' (e.g Aberfeldy, Abernethy and Aberdeen). The name Struan occurs much more rarely (in part because river names often retain their older names even during periods of extensive immigration) but there is a further example in Perthshire, with the variant spelling of Strowan, near Crieff. In the past Strowan and Struan were clearly interchangeable spellings of the same word: both are at various times used to name both places. What is particularly interesting about Strowan and Struan is that both are places where the meeting of the rivers (in Strowan's case the Earn and the Glascorrie Burn) are marked by the presence of an early medieval church site and early medieval or Pictish sculpture. Although the present Kirk is a 19th century rebuild there are several clues to the presence of a much earlier Church on the site. The circular shape of the churchyard: although it does not appear circular today it is clear from old maps that the churchyard has gradually been reduced in size and given a rectangular shape. A probably 18th century map of Struan (in Blair Castle Archives) in particular suggests that the churchyard was formerly much more rounded in shape. As a rule of thumb a round or circular churchyard indicates an early medieval date for the origin of that churchyard. The roundness or circularity may have been a reflection of the near universal idea of the sacred circle. The dedication to St Fillan: the origins and identity of St Fillan are obscure. There are approximately 20 saints with the name Fillan commemorated in early Irish written sources. Certainly by the 9th century there was a strong cult of St Fillan in what is now West Perthshire, with a particular focus in Glen Dochart and Upper Strathearn. The Fillan in question seems to have been someone born in Ireland, possibly of royal lineage, and who came to Pictland as a missionary. The cult of St Fillan continued through the later medieval period and was certainly boosted by the patronage of King Robert I. Saints calendars from the end of the Middle Ages indicate two Fillans in Scotland, with feasts on 20 June and 9 January. These could though be a confusion of the birth and death dates (important because it marked the point at which sainthood was gained) of the same Fillan. Allied to the dedication is a long established fair named (in the Gaelic) after St Fillan, Feill Faolan. This was held on the first Friday after New Year's Day, probably to coincide with the 9 January feast day. The fair was held on the field west of the Church, known as croft an' taggart or the 'Priest's croft/field'. From the early medieval period it was common for there to be a strong link between fairs and the church and this seems to be a good example of the practice. There is one more piece of evidence relating to St Fillan, an early medieval handbell named after the saint (though at times it was also known more affectionately as the Buidhean, or 'the little yellow one'). Such cast, iron and bronze hand-bells were a common feature of the early church and several examples survive from Perthshire. The bell is unlikely to have been associated directly with St Fillan and should be seen as part of the cult of St Fillan that was practised in Struan in the 9th/10th/11th centuries. So it is St Fillan's bell in the sense that it belonged to the church and community of St Fillan in Struan. It was kept by the church and remained in some kind of use (possibly as a 'deid-bell' and so chimed when a parishioner died or at the head of a funeral procession) until the 19th century when William McInroy of Lude gave the church a new bell in exchange for St Fillan's, which he kept at Lude House. There it remained until 1939 when the house and its contents were auctioned-off. The bell was purchased by philanthropist whisky-millionaire A K Bell on behalf of Perth Museum and Art Gallery. It is currently on display in the Human History Gallery of the Museum. Early medieval sculptures: also of key relevance to our understanding of the development of Christianity in the area is the survival of three Pictish or early medieval sculptures. All have been found, at various times, in the churchyard. Two of them are simple, quartzite-slate pillar-like stones incised with simple crosses. The first of these was found in 1868 during the digging of a grave. It stands in the middle of the churchyard and with careful inspection, its two crosses can still be seen. The second has been known since the end of the 19th century and is built into the west wall of the churchyard. It is difficult to find and the cross has suffered some damage since it was recorded at the end of the 19th century. Such carvings are generally seen as a mark of Christian missionary work in what is now Scotland between the 6th and 9th centuries. Use as burial markers are a somewhat remoter possibility. The third piece of sculpture was known by the 19th century when it stood in the churchyard, leaning against the south wall of the church. In the early 1970s, it was moved inside the church, where it now stands, for its greater protection. 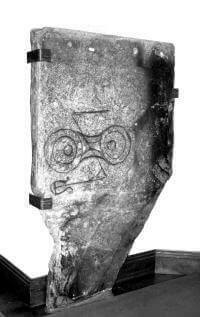 It is a large, irregularly shaped slab of schistose slate incised on one face with Pictish symbols. Clearly visible is a double-disc and a z-rod but the symbol next to it has been largely lost and its identity cannot be determined. The first drawing of the stone is that done for John Stuart's The Sculptured Stones of Scotland, published in 1856. Although the drawing was published upside down it records additional details now lost, suggesting that the only partially surviving second symbol may have bee the so-called 'flower' symbol and that there was a third symbol that was even then indistinct and certainly lost by the time Allen and Anderson's Early Christian Monuments of Scotland was published in 1903. These so-called Pictish symbols are a unique feature of early medieval sculpture in Scotland but their precise meaning remains far from clear. There are many theories that try to explain them: family badges, territory markers, burial markers, marriage or alliance signifiers, some other form of specific symbolic language, a reaction to the process of Christian conversion etc; but the prize of certainty remains elusive. The main geographical focus for the symbol stones is what might be termed Eastern Pictland, i.e. from the Forth northwards and excluding the West Highlands and Islands. In this area there are currently some 160 known sets of symbols. The z-rod (really a backwards z) and the double-disc occurs around 51 times as a pair (and each also occurs as separate symbols). Most to them are further north and east of Struan, notably in Aberdeenshire. The third crucial element in the landscape around Struan Kirk is the mound, which lies a few yards to the north-west of the Kirk. This mound has long been known as Tom an Tigh Mhoir - the mound of the great house. This Gaelic name may however be of comparatively recent origin, to explain the mound, the original purpose of which had been forgotten. In 1890 the antiquary MacIntosh-Gow recorded that on top of the mound the presence of clearly visible building foundations, said to be the remains of a house built by a local Laird but never finished apparently because a neighbour over the river Garry built a much higher castle. However the nature of the mound is such that if anyone should try and rather foolishly build on it they would soon find that they had no room and no weight bearing stability. Size: superficially it does look quite large but the available area to be built on is rather small when compared with other mottes and when this is set alongside the subsequent points it is even more telling. Ditch: there is no defensive ditch surrounding the mound nor any sign that there ever was one. There is a partial ditch of very shallow depth which runs around the northern perimeter which seems rather like a later addition possibly for drainage purposes. Location: the mound is built-up from the steep bank of the river Garry, which would make it structurally unsound - especially if built upon - particularly during flooding and high river levels. Spring: the sloping river-bank on which it is built is also the location of a spring, making it even more susceptible to slippage. This spring was long revered as the well of St Fillan and tradition records that a wooden statue of St Fillan (kept in the Kirk) was ritually dipped in the well at times of drought in the hope of bringing rain. In the early 18th century the then incumbent Minister John Hamilton, found this to be an unpalatable vestige of Catholic belief and so had the statue smashed and thrown into the Garry. There are still difficulties with identifying what the mound was used for and it clearly did seem to have supported some form of structure as lines of walls can still be seen on the mound. However it is possible that these relate to the construction of the mound itself or to a small building added at a much later date or a building started but abandoned. It is a strong possibility that a structure that has stood for as many centuries as the mound has had more than one episode of use and that what we see today is a conflation of use, re-use and adaptation. Given its physical appearance its location and its landscape context (including the early church and the placenames) it seems highly likely that the mound was originally constructed (or adapted) as a mound of assembly and /or judgement. Such mounds (sometimes known as moot hills) can be purpose built or adaptations of existing man-made or natural mounds. Such mounds of assembly are often associated with a church and seem to occur quite widely from the 9th/10th century. There seem to be two (not always) distinct traditions, Scandinavian (for example Govan on the Clyde and Tynwald on the Isle of Man) and Irish/Gaelic/British (for example Scone, Perthshire and Tara in Ireland). There also seems to be a wide range of mound sites, some beside churches, some with churches upon them and their precise subtleties of meaning require further study. Examples include Kirkinch (nr. Meigle), Angus; Eassie, Angus; Caputh, Perthshire; and La Hogue Bie, Jersey (where the church is built on top of a Neolithic burial mound). Caputh is notable for having been a moot-hill that was then use, from the 16th century, as the site for a new parish church and burial ground. It is close to Murthly (which means 'big mound'), the two places being on opposite banks of the river Tay, and from where three pieces of early medieval sculpture have been found during the last 100 years or so. If such sites also came to be linked with local lordships it is possible that the mound at Struan may be suggestive of an early thanage there, part of the lordship of Atholl. As many readers of this Annual will know Struan is part of the heartland of the Robertsons/Clan Donnachaidh. Certainly they would have been important patrons of Struan Kirk in the later medieval period (and beyond), would have practised the cult of St Fillan and may possibly have made some use of the mound. However the purpose of this short article has been to show that Struan has a much longer history than its association with the Robertsons and the Clan's first chief, Fat Duncan. Five hundred years and more before Duncan Pict and Scot were learning to live with each other, being converted to and practising Christianity and establishing their mechanisms of governance and social control.